4:01pm: The Lakers have officially signed Ingram, the team announced today in a press release. His new 10-day contract will run through March 20. 12:50pm: Veteran G League sharpshooter Andre Ingram is set to get another shot in the NBA, according to reports from Lauren A. Jones of The Los Angeles Sentinel and Shams Charania of The Athletic (Twitter links). Jones first reported that Ingram will be rejoining the Lakers, while Charania adds that the 33-year-old is signing a 10-day contract with the club. The G League’s all-time leader in three-pointers, Ingram had appeared in 384 NBAGL games over 10 seasons before finally getting a call-up at the end of 2017/18. The veteran shooting guard made a memorable debut for the Lakers last spring, racking up 19 points on 6-of-8 shooting (including 4-of-5 on threes) in an April contest vs. Houston. Although he hoped that brief audition would earn him a chance to compete for an NBA roster spot last fall, Ingram ultimately returned to the South Bay Lakers, where he has averaged 8.6 PPG on .393/.355/.830 shooting in a part-time role over 35 games this season. It has been a down year for Ingram, who still holds a .451 3PT% for his NBAGL career. The Lakers have an open roster spot, so they won’t need to make a corresponding move to clear space for Ingram. While that spot was originally considered likely to be used on a win-now veteran, the club has fallen out of playoff contention within the last couple weeks. Given the negative energy surrounding the Lakers during their recent slide, it makes sense that the team would instead opt to fill its roster by revisiting a feel-good story like Ingram’s. Ingram will earn $76,236 over the course of his new 10-day deal. Once it expires, the Lakers can either sign him to a second 10-day deal, give him a rest-of-season contract, or let him return to free agency. Controlling owner Jeanie Buss holds the key to Luke Walton‘s future as head coach, Bill Oram of The Athletic opines. If team president Magic Johnson urges Buss to make a coaching change in the near future or at the end of the season, she would have to choose between her loyalty to Johnson and her faith in Walton, Oram continues. There is growing uneasiness about Walton’s job security following a loss to the woeful Cavaliers, making the team 3-7 with LeBron James sidelined by a groin injury. Johnson’s unpredictable, ultra-competitive nature and his concerns about the staff increase the possibility of him pushing Buss to make a move, Oram adds. Free agent shooting guard and former Laker Jodie Meeks is a potential roster addition as the team looks to improve its outside shooting, ESPN’s Dave McMenamin tweets. The career 37.2% 3-point shooter worked out for the Sixers on Monday. The Lakers, who have an open roster spot, rank 27th in long-range shooting at 33.5%. Andre Ingram set a G League record for most career games played over the weekend, according to a G League tweet. Ingram, currently with the South Bay Lakers, played his 402nd game on Saturday. The 33-year-old guard made his NBA debut last season with the Lakers, appearing in two games. Lonzo Ball would rather lead by example because he’s not as vocal as veterans like James, Rajon Rondo and Tyson Chandler, Ohm Youngmisuk of ESPN reports. Ball has stepped up his efforts to be a leader with James and Rondo nursing injuries. Draymond Green set the record straight on his relationship with Kevin Durant after the Warriors‘ game on Sunday, telling reporters that he and Durant won’t be broken apart because of a previous locker room incident between the All-Star duo. Green was suspended in November following a heated verbal exchange with Durant, an altercation that included several profanities and Green telling Durant, “We don’t need you,” according to Yahoo’s Chris Haynes. Green’s anger stemmed from a disagreement in the final seconds of a Nov. 15 game, with the Warriors labeling his conduct as “detrimental to the team”. Green had a major voice in recruiting Durant back in 2016, with both stars playing key roles in helping the Warriors win titles in 2017 and 2018. Golden State has vastly improved since placing the locker room incident behind them, winning eight of their last 10 games and sporting a 23-11 record entering the final week of 2018. Longtime G League guard Andre Ingram is continuing to strive for an NBA career, Dan Woike of the Los Angeles Times writes. Ingram had a storybook NBA debut this past spring, getting a call-up with the Lakers after 11 straight seasons in the G League. Ingram currently plays for the team’s minor league affiliate, the South Bay Lakers, in hopes of receiving another shot during the 2018/19 season. It didn’t take long once free agency began for LeBron James to announce that he would become a Laker — his agency issued a press release confirming his decision on the evening of July 1, less than 24 hours after the new league year officially got underway. Still, the Sixers felt as if James gave them serious consideration before he opted to head to L.A., as Ohm Youngmisuk of ESPN.com writes. Sixers head coach Brett Brown, who said before free agency began that the team would be “star hunting,” isn’t walking back those comments and sounds committed to taking the same approach going forward, writes Derek Bodner of The Athletic. Even if the 76ers can’t pull off a trade for Kawhi Leonard or another star, they should have plenty of cap flexibility in 2019, when many more All-Stars will reach the open market. About six teams, including the Rockets, continue to express interest in free agent swingman Nick Young, tweets Mark Berman of FOX 26 Houston. A report earlier this week specifically identified Houston, Minnesota, Utah, Cleveland, Memphis, and Sacramento as teams with interest in Young, though it’s not clear if those are the same six that remain in the mix. While Marcus Smart‘s free agent outlook remains up in the air, Celtics president of basketball operations Danny Ainge calls the RFA guard Boston’s “highest priority” (Twitter link via Brian Robb of Boston Sports Journal). Asked today about the Celtics‘ plans for two-way restricted free agent Jabari Bird, Ainge replied, “We don’t know yet” (Twitter link via Mark Murphy of The Boston Herald). Bird has been Boston’s best player in Summer League action so far, averaging 18.0 PPG on 57.9% shooting, but it remains to be seen if the C’s will find room for him on their 15-man roster. After pouring in 19 points in his NBA debut as a 32-year-old in April, Andre Ingram isn’t satisfied with his brief NBA cameo. As Marc J. Spears of The Undefeated relays, even after being renounced by the Lakers, Ingram is seeking another NBA opportunity, and has received some interest – but no offers – from the league’s 30 clubs. Zach Lowe breaks down the winners and losers of free agency in an entertaining piece for ESPN.com. For better or worse, the Lakers have known exactly what they wanted and how to get it for several seasons now. Now that the 2018 free agency period is upon us, we’ll see if the salary cap posturing was worth it. In an effort to make themselves an appealing destination for LeBron James and/or Paul George the club has neglected and even outright punted up-and-coming talent. Given what’s at stake, any of Los Angeles’ own free agents will have to wait for dominoes to start falling before they can find out what kind of role – if any – is still available to them with the Lakers. Because of its history and location and all the inherent marketing opportunities that come along with being a celebrity in Hollywood, this organization is capable of things that nobody else is. Love it or hate, we’re going to see that on full display this summer. In today’s NBA there will always be a market for 3-and-D perimeter threats so whether it comes in Los Angeles or elsewhere, Caldwell-Pope should have no problem finding a suitor. That fact that he’s still only 25 years old only makes him all that more appealing. The problem, however – and the one thing standing between him and the max deal he allegedly sought last offseason – is that despite the guard’s legitimately impressive .423 three-point percentage after the All-Star Break, he’s never been a reliable go-to scoring option on a competitive team and appears to have a finite ceiling. Is the two-guard an untapped star or an elite niche player? I’d wager on the latter and caution any team desperate enough to pay him like the former. Frye saw a reduced role in 2017/18 after serving as a valuable depth piece for the championship-contender Cavaliers the past two seasons. Still, despite seeing his usage trend downward, the veteran is as sneaky dangerous as ever. It’s hard to imagine Frye earning much more than the veteran’s minimum in his 13th season but it’s easy to picture him knocking down critical threes for a contender come the 2019 postseason. Ingram had a memorable cup of coffee this season but isn’t likely to parlay the impressive debut into a full-time gig anytime soon. That said, the 32-year-old could find himself on the 10-day radar for depth-hungry teams late next season. That’s an improvement over a seemingly symbolic late-season addition in 2018. Lopez has done an admirable job developing a three-point shot late in his career and that will likely help him prolong it, but don’t expect him to land another featured role like he had with the Nets anytime soon either. Lopez is on the wrong side of 30 and has never been a particularly feared rim protector. Expect the veteran to contribute meaningful minutes to a contender at a drastically reduced rate; playoff-bound teams don’t have the cap space and the rest shouldn’t even be looking. Watching the Lakers mishandle Randle over the course of the past two seasons would have been outright inexcusable if they didn’t have a legitimate chance of landing a premier free agent or two this summer. They do, so we’ll let them off the hook, but if any other franchise were to drag an absolute workhorse through the mud for two seasons just because they wanted to keep their options open for free agency, we’d be laughing at them. Randle, a restricted free agent, is going to get paid this offseason and he should, my only hope – for the sake of the young man’s dignity – is that it comes from an organization that hasn’t made it abundantly clear that he’s a third or fourth priority. Fun prediction: Randle makes an All-Star team before any of Lonzo Ball, Brandon Ingram or Kyle Kuzma. For a fleeting moment in time, the stars aligned such that Thomas – an undersized, volume-shooting journeyman – was an honest-to-goodness MVP candidate. That, however, doesn’t mean that Thomas is or ever was a max player. While the drop in Thomas’ value here in 2018 can be lazily chalked up to his hip injury and the fact that he’ll be 30 years old by the end of next season, it wouldn’t have even felt right this time last season for a team to commit north of $25MM to a ball-dominant guard with a Napolean Complex. I can see Thomas as a world-class reserve combo guard if his hip holds up into the second-half of his career, I’m just not confident that he would share my vision. The Lakers brought Wear aboard as a last-season depth add and while he may not break camp with the team next season, he may have shown enough during his brief stint with the franchise to warrant a call-up earlier in the season next year. The Lakers may not have much of an interest in investing substantially in the forward but he’s a familiar face that could end up back in purple and gold eventually. 3:32pm: The Lakers have officially signed Ingram, the team announced today in a press release. 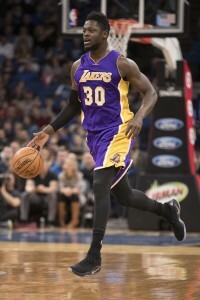 2:42pm: The Lakers are signing veteran G-Leaguer Andre Ingram to a rest-of-season contract that will cover the last two games of the 2017/18 campaign, reports Bill Oram of The Orange County Register (Twitter link). L.A. currently has an open spot on its 15-man roster, so no corresponding roster move will be required. Ingram, a 6’3″ guard, has played in the G League for 10 seasons, appearing in 384 games for the Utah Flash (now known as the Delaware Blue Coats) and the South Bay Lakers (formerly the Los Angeles D-Fenders). In 2017/18, Ingram averaged 9.1 PPG and 2.5 RPG in 47 games (22.8 MPG) for South Bay. He’s a three-point specialist, having converted 47.5% of his long-distance attempts this season, and an NBAGL-record 713 over the course of his career (46.1%). Despite his extensive G League experience, Ingram has never played in an NBA game. At age 32, he’s unlikely to be part of the Lakers’ long-term plans, and his contract won’t extend until next season, given L.A.’s desire to maximize its 2018 cap room. As such, the move looks like an opportunity to give Ingram a chance to play in the NBA for a couple games, and to get him two or three days’ worth of an NBA salary. A three-day minimum salary for Ingram would be worth just shy of $14K.